Vertigo places vertigo patients at an extreme risk of bad falls. Researchers from the University of North Carolina at Chapel Hill and North Carolina State University have now discovered a way to prevent falls in people suffering vertigo and dizziness. And the cure lies in watching a video on a computer screen, like the one you’re reading now. They published their method in Nature Scientific Reports. The researchers made their volunteers walk on a treadmill while facing a curved screen that displayed a moving hallway. To trick their participant’s brains into believing they were extremely dizzy and/or falling, the scientists added side-to-side movements to the footage on the screen. This is a clever trick because, while your brain knows you are not falling when placed in this situation, the visuals will make you feel like you are losing your balance and your brain will try to compensate for what you see and feel. This is where the experiment becomes quite ingenious. Through 14 cameras placed around their subject’s bodies and electrodes attached to their skins, they recorded how these desperately dizzy walkers altered their walking strides and body postures to stay safely upright. The details of how each individual person compensates for a loss of balance is valuable, as it can be used to train them to do all this better in situations where their balance is even worse than in this virtual reality setting. This is where this study is useful for the prevention of falls in people with vertigo. 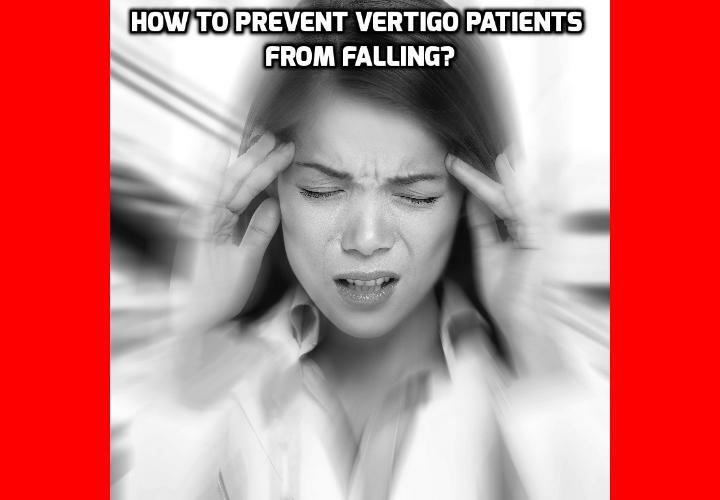 Training vertigo patients to walk while they feel dizzy cannot take away their vertigo, but it can help them stay upright while they feel like they are spinning. In the virtual reality study, people’s walking varied a lot more between short and long steps instead of taking steps of approximately the same length as usual. Vertigo patients also used their core muscle to sway their bodies back and forth while they were walking, instead of holding their bodies more or less still like we usually do. Their muscles synchronized perfectly with each other to find a coordinated physical response to the dizziness.